9 1/8 by 12 1/4 in. An exceedingly rare and important Delacroix pastel with historic provenance. As one of the keepers of Delacroix’s legacy, and the editor of the Letters of Delacroix published in 1878, Philippe Burty, emerged as one of the most dedicated collectors of contemporary art including prints as well as Japanese art in all media. He was the first owner of this pastel. Since Burty had an intimate knowledge of the way in which Delacroix worked, had access to unpublished material, and was able to discuss Delacroix’s approach to creativity with the artist and some of his students, this pastel has an impeccable provenance allowing the work to emerge as a rare example of the French romantic artist’s work which remains outside of museum collections. 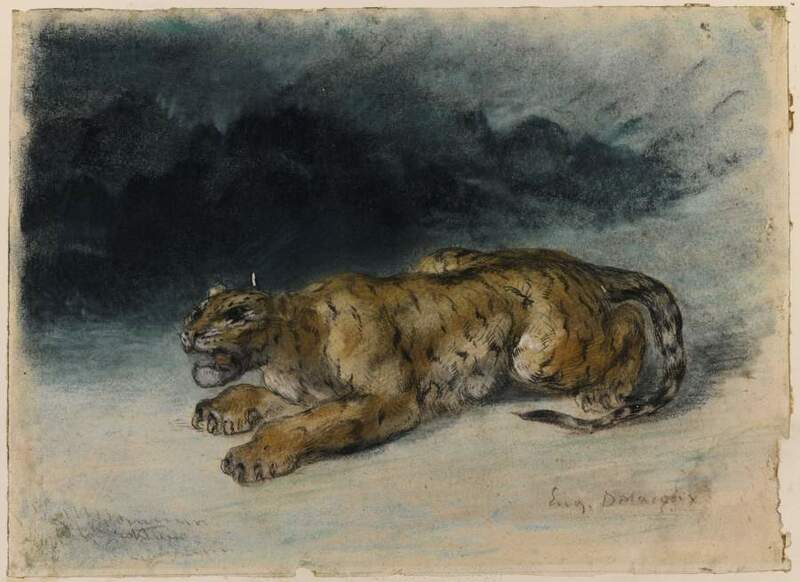 Since considerable interest is now focused on Delacroix’s work through new books and exhibitions, he is seen as the primary example among artists of his generation in the use of brilliant evocative color in painting , watercolors and drawings. Recognized now as a precursor in the evolution of the modern movement, this pastel, with its loose energetic application of the medium, provides a significant clue as to why Delacroix is held in such high regard by collectors. His sense of independence and personal power are hallmarks of his style. The romantics also placed considerable emphasis on animals in their works as horses, lions and tigers are often depicted; the primary example in sculpture being Antoine-Louis Bayre. These animals symbolized the dynamic power of the Romantic Movement and its abiding interest in exotic material that dominated much of the tradition. This pastel is no exception. The vigor of the execution, the sense of urgency that the tiger conveys, provides a way in which the image mesmerized the original collector while also becoming part of a series of impressive collections in the United States. The pastel is a rare object, which any collector of nineteenth century art would be proud of owning.
 . Gabriel P. Weisberg, The Independent Critic. Philippe Burty and the Visual Arts of Mid-Nineteenth Century Art, New York: Peter Lang, 1993.
 . Patrick Noon and Christopher Riopelle, Delacroix and the Rise of Modern Art, London: National Gallery Company Limited, 2015.